Santa Cruz County occupies just a small slice of the central California coast but contains an amazing diversity of habitats within its limited boundaries: sea cliffs, coastal estuaries, extensive redwood forests, patches of chaparral and coastal scrub, and thickly-forested slopes in the Santa Cruz Mountains. Those forests contain the southernmost coastal breeding populations of several deep-woods species, including Pileated Woodpecker and Varied Thrush. There are numerous vagrant traps along the coast from the urban areas of Santa Cruz itself to the Pajaro River. The northern half of Monterey Bay is within county waters and, while most boat trips leave from Monterey, a wide selection of pelagic species have been located within SCZ. Indeed, in many years the famed storm-petrel flock forms over the Soquel Canyon portion of Monterey Bay, inside the Santa Cruz line. County birding statistics and links are on Joe Morlan's site. A plethora of birding information — directions to birding spots, rarities, birding history, and much more — is on the Santa Cruz Bird Club web site. 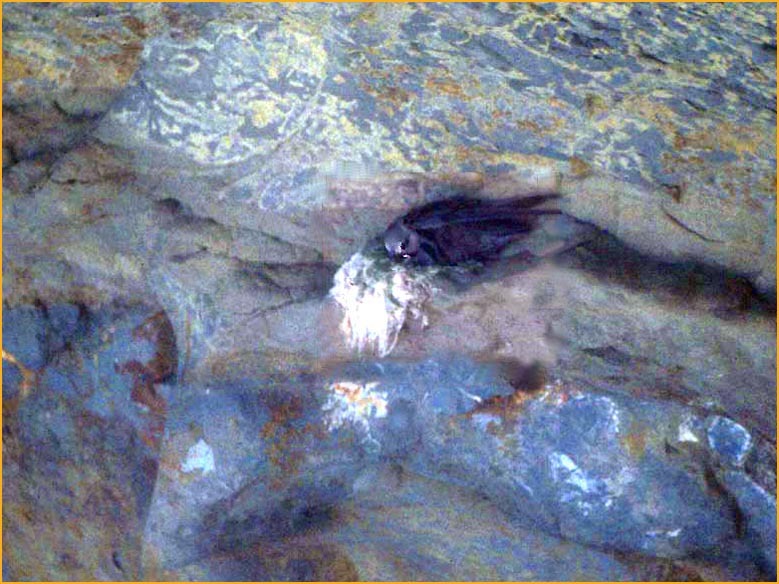 For Santa Cruz County the opening photo is one taken many years ago: a Black Swift on its nest in a sea-cave in the cliffs below Lighthouse Pt. It is not a very good picture — the film is grainy and the bird distant. The high-speed film was necessary to get even any type of photo in the perpetual shade where the nest was placed [it is duly noted that those with good equipment, such as Ron Branson, got some fabulous shots of this nest]. Nonetheless, I like the photo because of the memories: I've not seen a Black Swift nest again, anywhere, and the nesting population in SCZ has disappeared over the past decade. The species seems on the decline in MTY as well. Plus, as I worked with the photo in PhotoShop to bring out what I could, I started noticing the lovely colors in the rocks that make up the cliff face. As Santa Cruz County is just north of Monterey County, where I live, I sometimes chase exceptional vagrants there. 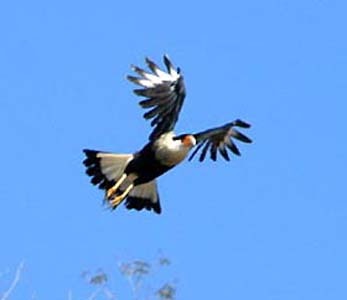 One of them was a Crested Caracara (below left; photo taken 30 Oct 2005) that was present along Swanton Road in fall 2002 and again in fall 2005). Since I am also often on Monterey Bay pelagic trips, I am taken (usually unwillingly) into SCZ waters regularly, in the northern part of the Bay. 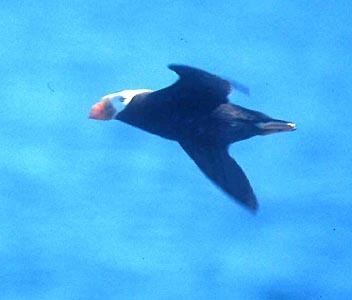 This adult Tufted Puffin (below right; 24 Aug 2003) flew past the boat right at mid-Bay, essentially on the MTY-SCZ line.